Shares in Paddy Power Betfair fell more than 5% despite the bookmaker reporting rising revenues and underlying profits. Revenues rose 18% to £1.55bn last year, with underlying operating profit jumping 44% to £330m. But after the costs of last year's merger between Paddy Power and Betfair were taken into account the company reported a loss of £5.7m. Analysts at Liberum said the company's performance in the final quarter of 2016 had been "disappointing". "It seems likely that operational challenges will continue around the performance of cross-sell to sports customers and the investment required to stimulate growth," Liberum said in a research note. 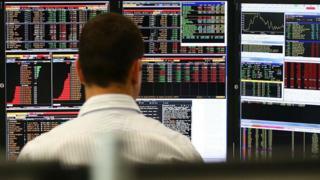 Overall, the FTSE 100 closed lower, having traded higher for much of the sessions, losing 10.75 points, or 0.15% at 7,339.37. "Markets remain becalmed for yet another day, hampered by a lack of data and a general wariness ahead of the ECB [European Central Bank] on Thursday, NFPs [US employment figures] on Friday and a Fed meeting next week," said Chris Beauchamp, chief market analyst at IG. Shares in Direct Line fell 2.9% after the insurer reported a fall in full-year profits due to changes in the way that compensation payments are to be calculated. Pre-tax profits fell 30% to £353m, with changes to the payment formula cutting profits by £217m. In the FTSE 250, shares in Aggreko sank 11% after the temporary power provider said it expected profits to fall this year. On the currency markets, the pound fell 0.29% against the US dollar to $1.2203 and was also 0.27% lower against the euro at 1.1535 euros.